To Cite: Fathi P, Pourbaktyaran E, Tasdighi E, Esfandiar N, Kazemi Aghdam M. An Unusual Presentation of a Child with Hyperoxaluria, Arch Pediatr Infect Dis. 2019 ; 7(1):e67357. doi: 10.5812/pedinfect.67357. Introduction: Hyperoxaluria is a common abnormal finding in patients with nephrolithiasis, especially in children in contrary to adults. Overall, it is a rare disorder with the four main types of primary, enteric, dietary and idiopathic. The disorder is characterized by overproduction of oxalate that leads to nephrocalcinosis and eventual development of end-stage renal failure. Case Presentation: We report the case of a 2-year-old boy presented with multiple episodes of seizure, gastrointestinal bleeding, loss of consciousness and rise in blood urea nitrogen (BUN) and creatinine (Cr). He underwent imaging study and lumbar puncture with the suspicion of encephalitis. With more history-taking, we understood that he was previously under treatment for nephrocalcinosis. Finally, he underwent dialysis and the level of consciousness improved. His diagnosis was confirmed by renal biopsy and establishing the existence of extensive tubular and interstitial crystal deposition in his kidneys. Conclusions: The case illustrates the need for the early diagnosis of this disorder to prevent systemic oxalosis that affects many organs resulting in severe morbidity and mortality and raising the suspicion of primary hyperoxaluria in childhood progressive renal failure with massive nephrocalcinosis, especially if accompanied by a positive family history. In these cases, complications should be explained to increase drug compliance. Hyperoxaluria is a rare disorder, but a common abnormal finding in patients with nephrolithiasis, which comprises four main types. Primary hyperoxaluria (PH) is the rare form of hyperoxaluria that is due exclusively to a genetic defect that causes a loss of specific enzymatic activity (alanine-glycosylate aminotransferase in PH type 1 and D-glyceric dehydrogenase in PH type 2), resulting in increased endogenous oxalate production and urinary excretion. The disease is more common in North Africa and the Middle East (1, 2). Enteric, dietary and idiopathic hyperoxaluria are related to gastrointestinal disorders and life style. High level of oxalate in the system can produce various health problems, particularly urolithiasis, nephrocalcinosis and chronic renal failure that may lead to early end-stage renal disease (ESRD) (3). Serious complications such as cerebrovascular events (CVA) and myelophthisis are also reported (4, 5). We reported the case of a boy that presented with multiple episodes of seizure, gastrointestinal bleeding and loss of consciousness, whose laboratory findings were consistent with ESRD and ultrasound showed bilateral massive nephrocalcinosis. His diagnosis was confirmed by renal biopsy and establishing the existence of extensive tubular and interstitial crystal deposition in his kidneys. A 2-year-old boy presented with seizure and gastrointestinal (GI) bleeding after two days of malaise and coryza symptoms, which was treated with Azithromycin. His first seizure happened six hours before his admission, when he presented with unilateral tonic colonic seizure with upward gaze, drooling and postictal confusion, which was controlled by rectal Diazepam at a local clinic. Hours later, the second episode occurred with a similar pattern, except for an addition of hematemesis. It was controlled with two doses of rectal Diazepam and Phenytoin. Furthermore, he received one unit of packed cell because of low hemoglobin level, which was 6.5 gr/dL at that hospital. On transferring to our hospital equipped with pediatric intensive care unit (PICU), he had a sudden cardiac arrest. Standard cardiopulmonary resuscitation was performed, by emergency medical services (EMS). On admission, he had spontaneous breathing, active GI bleeding and a Glasgow Coma Scale (GCS) score of 7/15 with vital signs of respiratory rate: 29 per minute, pulse rate: 140 bpm, temperature = 37.5°C, blood pressure: 80/40, O2 saturation of 60% without supplement and 90% with O2 therapy. Initial physical examination was unremarkable, except for decreased sound in the left lung and active bleeding of his nose and mouth. At the Emergency Department, he experienced three more episodes of seizure with progression to epilepticus, which were controlled with intraventricular Diazepam and 15 mg/kg of Phenytoin. Blood sugar was 490. He was intubated, nasogastric tube was fixed and he received fresh frozen plasma, octreotide and pantoprazole. Finally, after controlling GI bleeding and stabilization, he was transferred to PICU. He was the first child of a consanguineous marriage with delayed developmental milestones, who was diagnosed before to have renal stones following work ups for recurrent urinary tract infections with a positive family history. The family had no GI disorders or any special dietary habits. He was being treated with pyridoxine and potassium citrate solution, which was had been stopped and replaced with herbal medicine two months before. Laboratory investigations showed metabolic acidosis with respiratory alkalosis (pH: 7.2, PCO2: 19.7, HCO3: 7.8), hypocalcemia (Ca: 6.2), hypokalemia (K: 2.9), hyponatremia (Na: 120), high levels of BUN (124 mg/dL) and Creatinine (4.3 mg/dL). Complete Blood Count showed normocytic normochromic anemia with hemoglobin level of 11.7 gr/dL (after transfusion), platelet count of 111 × 103/mL and leukocyte count of 7.4 × 103/mL with a differential of 81.5% neutrophil and 15.1% lymphocyte with normal peripheral blood smear. Urinanalysis demonstrated a specific gravity of 1.005 and pH of 6. There were 1+ urinary protein and negative ketone. Cast or crystal was not found, urine random Ca was 1.5 and Pr/Cr was 1.1. X-ray demonstrated bilateral patchy alveolar opacity representing bronchopneumonia, slight pleural effusion on the left side and abdominal abnormal ileus pattern. He underwent a brain computed tomography (CT) that showed mild subgaleal swelling in the right occipital region and opacification of ethmoid and sphenoid sinuses plus left mastoid and middle ear cavity opacification. Cerebrospinal fluid was normal. Ultrasound revealed bilateral increased renal corticomedullary echogenicity in favor of nephrocalcinosis and multiple stones in all poles of both kidneys. The largest stone in the right kidney was in the lower pole and about 9 × 8.5 mm in size, and in the left kidney also it was in the lower pole and measured about 10 × 9 mm. At PICU, the GCS score remained low, and electrolyte abnormalities were corrected. The patient received calcium carbonate and calcium gluconate. Also, hyponatremia and hypokalemia were corrected and insulin was injected after the correction of hypokalemia. Maintenance treatment of Phenytoin, Phenobarbital, Pantoprazole and Octreotide was initiated. Antibiotic dosage was adjusted with glomerular filtration rate of 10 to 25. Dexamethasone was injected for brain edema. The patient became edematous, and therefore, he underwent aggressive peritoneal dialysis while he was being treated with sevelamer and calcium supplement. Three days after the initiation of dialysis, his level of consciousness increased, and he was extubated and transferred to the Nephrology Ward. Blood sugar was controlled without insulin after increasing of GCS. After 10 days of admission under maintenance therapy by Phenytoin, he experienced two more episodes of seizure that were controlled by increasing the dose of Phenytoin. 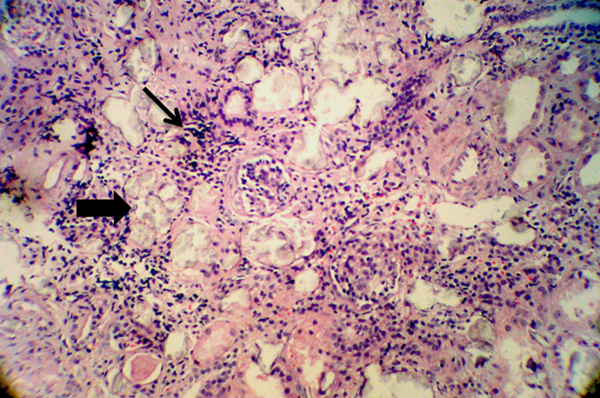 During the hospitalization period, kidney biopsy was obtained that showed interstitial inflammation (Figure 1), intra tubular oxalate crystal deposition (Figure 2) and peri-glomerular fibrosis (Figure 3). Figure 1. Interstitial inflammation (thin arrow) and intra tubular oxalate crystal deposition (thick arrow) H & E x200. Figure 2. 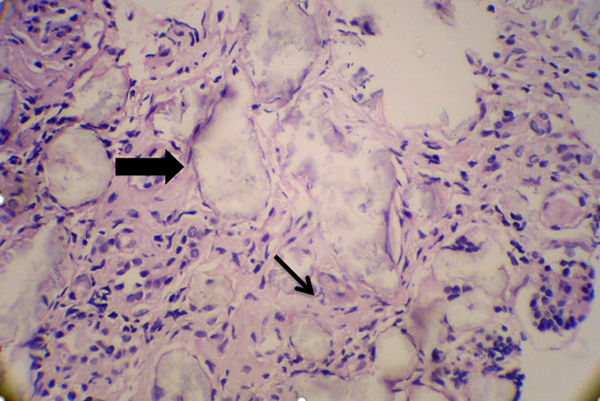 Intra tubular crystals (thick arrow) and mild interstitial fibrosis (thin arrow) H & E x400. Figure 3. 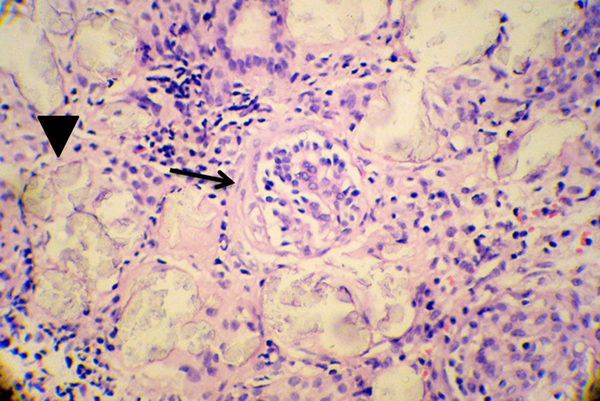 Peri glomerular fibrosis (thin arrow) and intra tubular oxalate crystals (arrow head) H & E x400. Hyperoxaluria is a group of genetic and non-genetic disorders characterized by oxalate overproduction. This condition is classified into two types of primary hyperoxaluria (PH), which consists of three types, and secondary hyperoxaluria, which comprises enteric, dietary and idiopathic hyperoxaluria. PH-1 is the most severe and common type, in which deficiency is in specific hepatic AGT enzyme (6, 7), the second and third types are much less common in which the missing enzyme is D-glyceric dehydrogenase/glyoxylate reductase/hydroxy pyruvate reductase due to the mutation in the HOGA1 gene (8, 9). The consequences of hyperoxaluria are related to stone formation and subsequent damage to the urinary tract, including renal obstruction, urosepsis, renal failure and even death. As the glomerular filtration rate falls below 30 to 40 mL/min/1.73 m2, the combination of reduced renal function and continuous oxalate overproduction by the liver may result in systemic oxalosis (10). Oxalate deposition can occur in other organs such as bones, joints, eyes, heart, vessels, nerves, brain and liver resulting in severe morbidity and mortality (11-13). Bone tends to be the major repository of excess oxalate, which consequently increases resorption and declines osteoblast activity, leading to spontaneous fracture, pain, erythropoietin-resistant anemia and myelophthisis due to extensive bone-marrow deposition of calcium oxalate crystals (5). Oxalosis may lead to cardiac conduction abnormalities and arrhythmias, and circulating oxalate precipitate may be a potential mechanism for CVA (4). Moreover, oxalate deposition in the retinal epithelium and the macula can result in diminished visual acuity and blindness (14). Hypothyroidism, peripheral neuropathy, dental problems (e.g., tooth pain, root resorption and pulp exposure) and skin manifestations including livedo reticularis, peripheral gangrene and calcinosis cutis metastatic are other complications (15-17). Because symptoms occur relatively late and are associated with serious complications and considering the association of its prognosis with early treatment and renal deterioration, all pediatric patients who have stones are better to be screened for hyperoxaluria. That does not mean it should not be considered in adults because no significant differences in mean urinary oxalate excretion levels or concentrations have been found between geriatric and younger cohorts of individuals with calcium oxalate stones (18, 19). Hypercalciuria is more common in these patients, however, excess urinary oxalate is the main promotor of urinary stone formation, thus, it should not be neglected. Our patient developed severe and irreversible renal failure following a mismanagement. If at the initiation of therapy, enough information about the disease complications were provided to the parents, the compliance with medication consumption would have been better and this fatal complication did not happened. Early diagnosis and treatment can prevent renal failure and lifelong dependence to dialysis. Combined liver-kidney transplantation is recommended as the treatment of choice in patients with primary hypercalciuria and ESRD. 1. Harambat J, Fargue S, Acquaviva C, Gagnadoux MF, Janssen F, Liutkus A, et al. Genotype-phenotype correlation in primary hyperoxaluria type 1: the p.Gly170Arg AGXT mutation is associated with a better outcome. Kidney Int. 2010;77(5):443-9. doi: 10.1038/ki.2009.435. [PubMed: 20016466]. 2. Gargah T, Khelil N, Gharbi Y, Karoui W, Trabelsi M, Rajhi H, et al. Primary hyperoxaluria type 1 in Tunisian children. Tunis Med. 2011;89(2):163-7. [PubMed: 21308625]. 3. Hoppe B, Beck BB, Milliner DS. The primary hyperoxalurias. Kidney Int. 2009;75(12):1264-71. doi: 10.1038/ki.2009.32. [PubMed: 19225556]. [PubMed Central: PMC4577278]. 4. Rao NM, Yallapragada A, Winden KD, Saver J, Liebeskind DS. Stroke in primary hyperoxaluria type I. J Neuroimaging. 2014;24(4):411-3. doi: 10.1111/jon.12020. [PubMed: 23551880]. [PubMed Central: PMC4156598]. 5. McKenna RW, Dehner LP. Oxalosis. An unusual cause of myelophthisis in childhood. Am J Clin Pathol. 1976;66(6):991-7. [PubMed: 998570]. 6. Beck BB, Hoyer-Kuhn H, Gobel H, Habbig S, Hoppe B. Hyperoxaluria and systemic oxalosis: an update on current therapy and future directions. Expert Opin Investig Drugs. 2013;22(1):117-29. doi: 10.1517/13543784.2013.741587. [PubMed: 23167815]. 7. Harambat J, Fargue S, Bacchetta J, Acquaviva C, Cochat P. Primary hyperoxaluria. Int J Nephrol. 2011;2011:864580. doi: 10.4061/2011/864580. [PubMed: 21748001]. [PubMed Central: PMC3124893]. 8. Cramer SD, Ferree PM, Lin K, Milliner DS, Holmes RP. The gene encoding hydroxypyruvate reductase (GRHPR) is mutated in patients with primary hyperoxaluria type II. Hum Mol Genet. 1999;8(11):2063-9. [PubMed: 10484776]. 9. Monico CG, Rossetti S, Belostotsky R, Cogal AG, Herges RM, Seide BM, et al. Primary hyperoxaluria type III gene HOGA1 (formerly DHDPSL) as a possible risk factor for idiopathic calcium oxalate urolithiasis. Clin J Am Soc Nephrol. 2011;6(9):2289-95. doi: 10.2215/CJN.02760311. [PubMed: 21896830]. [PubMed Central: PMC3358997]. 10. Morgan SH, Purkiss P, Watts RW, Mansell MA. Oxalate dynamics in chronic renal failure. Comparison with normal subjects and patients with primary hyperoxaluria. Nephron. 1987;46(3):253-7. doi: 10.1159/000184364. [PubMed: 3306417]. 11. Mookadam F, Smith T, Jiamsripong P, Moustafa SE, Monico CG, Lieske JC, et al. Cardiac abnormalities in primary hyperoxaluria. Circ J. 2010;74(11):2403-9. [PubMed: 20921818]. [PubMed Central: PMC5929473]. 12. Lammie GA, Wardlaw J, Dennis M. Thrombo-embolic stroke, moya-moya phenomenon and primary oxalosis. Cerebrovasc Dis. 1998;8(1):45-50. doi: 10.1159/000015815. [PubMed: 9645982]. 13. Johnson JS, Short AK, Hutchison A, Parrott NR, Roberts IS. Small intestinal infarction: a fatal complication of systemic oxalosis. J Clin Pathol. 2000;53(9):720-1. [PubMed: 11041066]. [PubMed Central: PMC1731238]. 14. Small KW, Scheinman J, Klintworth GK. A clinicopathological study of ocular involvement in primary hyperoxaluria type I. Br J Ophthalmol. 1992;76(1):54-7. [PubMed: 1739695]. [PubMed Central: PMC504153]. 15. Maldonado I, Prasad V, Reginato AJ. Oxalate crystal deposition disease. Curr Rheumatol Rep. 2002;4(3):257-64. [PubMed: 12010612]. 16. Blackmon JA, Jeffy BG, Malone JC, Knable AL Jr. Oxalosis involving the skin: case report and literature review. Arch Dermatol. 2011;147(11):1302-5. doi: 10.1001/archdermatol.2011.182. [PubMed: 21768445]. 17. Marconi V, Mofid MZ, McCall C, Eckman I, Nousari HC. Primary hyperoxaluria: report of a patient with livedo reticularis and digital infarcts. J Am Acad Dermatol. 2002;46(2 Suppl Case Reports):S16-8. [PubMed: 11807460]. 18. Gentle DL, Stoller ML, Bruce JE, Leslie SW. Geriatric urolithiasis. J Urol. 1997;158(6):2221-4. doi: 10.1016/s0022-5347(01)68203-x. 19. Goldfarb DS, Parks JH, Coe FL. Renal stone disease in older adults. Clin Geriatr Med. 1998;14(2):367-81. [PubMed: 9536110]. 20. Sato S, Fuchinoue S, Kimikawa M, Tojimbara T, Nakajima I, Teraoka S, et al. Sequential liver-kidney transplantation from a living-related donor in primary hyperoxaluria type 1 (oxalosis). Transplant Proc. 2003;35(1):373-4. [PubMed: 12591446]. 21. Malde DJ, Pararajasingam R, Tavakoli A, Campbell B, Riad H, Parrot N, et al. Transplantation in adults with primary hyperoxaluria: single unit experience and treatment algorithm. Ann Transplant. 2011;16(4):111-7. [PubMed: 22210430].